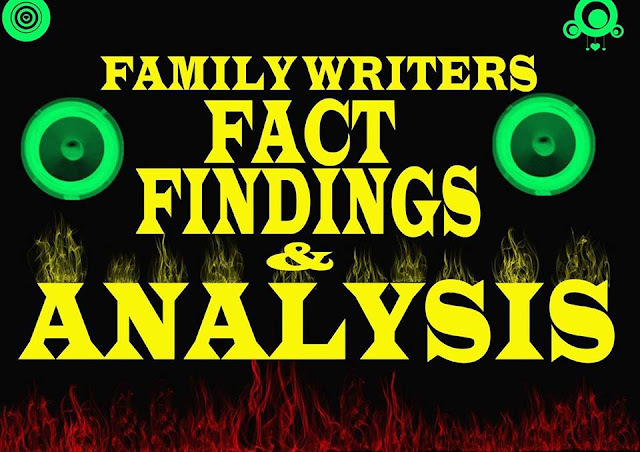 Once again, we welcome you all to this week's edition of Family Writers Fact Findings And Analysis coming to you from Sunday Okafor, Paul Emerenini and Ekwenye Samuel Chukwunweike of Family Writers. It is amazing that Prof. Yemi Osinbajo (the vice and acting president of Nigeria) who never uttered any word concerning the unlawful incarceration of Nnamdi Kanu and killing of Biafrans since he assumed office on 29th May 2015; just condemned the continuous incarceration of Nnamdi Kanu (the leader of Indigenous People of Biafra) alongside others who are being illegally incarcerated by the Nigeria government and their DSS counterpart. This recent and unexpected concern towards Nnamdi kanu the IPOB leader by the vice president of Nigeria came to many as a surprise, because the same man who condemned this atrocious crime meted on the IPOB leader was same person who has been silent all this while when president Muhammadu Buhari has not gone on vacation. While others call it hypocrisy and politics, others are waiting for the action of the vice president and presently the acting president of the contraption called Nigeria, "Yemi Osinbajo" towards ensuring that the unlawful incarceration and killing of Biafrans is brought to an end and the perpetrators brought to book; in other to justify that he is not trying to play the game of politics with the said issue or simply playing to the gallery. Now that the door is open and the road is clear, will Osinbajo make the same mistake president Buhari made by keeping silent and not putting up the necessary and sensible actions needed? The answer is not farfetched. Knowing very well that Nigeria is not a place of living for Biafrans and humanity at large, there is no need for Biafrans to believe or trust on any political elite in Nigeria for help, because none of them are ready to support the restoration of Biafra freedom. Therefore, the best thing is for Biafrans to focus on the pursuit for the restoration of Biafra. WHY IS NIGERIAN VICE AND ACTING PRESIDENT YEMI OSINBAJO NOW SPEAKING ON NNAMDI KANU'S UNLAWFUL INCARCERATION? Looking at the statement made by Nigerian vice President, there's no doubt that Nigeria government is using him to divert the attention of Biafrans from focusing on the pursuit of Biafra restoration. Yoruba people are very deceitful and dangerous in nature. So we Biafrans don't have to pay attention to such deceitful speech from a cunning man who have been silent since Buhari ordered the massacre of innocent citizens of Biafra, and all the atrocious crime metted against Biafrans. 1. For Biafrans to remain focused on the pursuit for freedom and self determination of all Biafra territories. 2. Biafrans should never rely on any Nigeria politician to speak on their behalf just like Yemi Osinbajo is displaying. The Nigerian military agent has once again showcased their heartless feature by manhandling a Biafran crippled man at the city of Onitsha in Anambra State of Biafra land. The crippled man by name Mr Raphael Chijioke was said to have worn a military Camouflage on the street where he begged for alms for greener pastures before he encountered his lifetime story memory, as the men of terrorist sect in Nigeria military uniforms who were passing by, stopped on glancing at the disabled man's military camouflage outfit. The Nigeria military without any mercy bounced on this cripple man and descended upon him heavily. They took him down from his wheelchair, gave him terrorist torture, and finally threw away his wheelchair. 1. What was the offence of this crippled man? His offense remains that he is a Biafran under a critically disabled condition. The fact remains that not only when you display Biafra flag or declare you are a Biafran that the murderous Nigeria security agents will classify you as a Biafran. They all know the truth, but are afraid of abiding in it due to the evil seed that has been planted into them by corrupt structure of Nigeria. It should also be noted that Biafrans are hated by other tribes of Nigeria. Despite that Biafrans allowed their resources to be misused by Hausa and Yoruba counterparts in order to earn a peaceful coexistence, yet their blood have continuously been spilled on the streets of Biafra land on daily basis. 2. Whose office is it to handle such a case? Even if the cripple man was ignorant of the law, the murderous terrorists in military uniform would have channelled the case to the appropriate quarters where the law breaker will be charged. Under no circumstances should the military take laws into their hands. The rule of law ought to be respected. 3. Why was he manhandled in such a manner? He was manhandled in such a manner in other to make life difficult for him and also, as a means of suffocating the Biafrans, without minding the condition of the poor man. We must recall that the crippled man Mr. Raphael Chijioke, was tortured by two Hausa corporals Mr. Barture Samuel, Abdulazeez Usman alongside their junior officers. In any civilized society, such an inhumane act shouldn't have happened. No matter how the military uses or enforces their power on the civilians, considering the condition of the poor man. However, one may argue that ignorant of the law is not an excuse, yes but the truth remains that this man has nothing to feed himself on talk more of having the money to buy some clothes for himself. With his natural condition, he does not in any way, deserve such inhuman treatment and the army authority has not taken much action against the brutal soldiers as the information from the military camp claims that they have been sentenced two months jail and also, a removal from their previous grades as corporals to street soldiers. With this, we end the week's edition of FWFFA. Remain blessed as we prepare for a better analysis next week, goodbye.